So, are you doing any work? Or just laying in the shade and drinking beer? Thanks for all the updates and photos! I am really looking forward to your workshop/demo visit to T'ba for the March meeting. I have selected a big clero for you to help me out with. 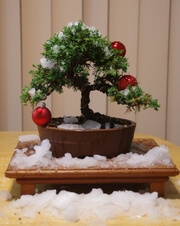 Bonsai Club: Toowoomba Bonsai Group Inc.
Graeme wrote: So, are you doing any work? Or just laying in the shade and drinking beer? Working hard as always Graeme, but still finding time for the other. Sounds good Stew. Look forward to seeing you and tree then. Thank you for these Tony we are really looking forward to May and looking over the new site. Just alittle too far for just a weekends drive for us. Looking forward to the end of month to Mr and Mrs Pup. Start of a big 3 weeks. 5 days in Perth. 2 at home. 4 days in Toowoomba. 2 at home. Then 5 days in Dunedin. Had some fun working on my air layered Juni today and have done the next step of wiring secondary branches to develop the branch pads. Nothing has been done to this tree since Sept last year so it could grow free and get some strength to the roots after seperating the layer. All the primary branch wire was removed and I set about applying the 1mm wire to the fine branches to develop the branch pads. A couple of excess branches were removed as expected from the initial styling and more growth is required on the upper right and apex, but I am very happy with the how this tree is coming along. I jinned the removed branches to add to the deadwood. I think a Bonsai pot in spring is on the cards when the nebari will be better developed, although it will not be the finished pot then. I have been concentrating lately on bud thinning and needle plucking a few of my Pines and have updated 3 posts on the blog in the last few weeks detailing what I do with my Pines at this time, and indeed at any time they need pruning. I would normally prefer to do this work a little earlier, but we get an extended growing period up here in Bris so can get away with an extended season of pruning as we will still get growth before our very moderate winter. Whilst Pines require more detailed pruning at certain times of year to get the best results, there is not a lot of difference in the basic requirements of what is fundamentally needed to create good design and ramification to the structure of any tree. Trees need to be pruned to maintain shape and develop more structural branching. With that pruning comes a reduction in foliage size to improve proportion. Taking out a terminal bud will create more buds behind it which will grow into branches. By removing those terminal buds when the foliage is smaller, it will stay small. Keeping a tree well fed and strong means it will create more buds containing smaller foliage, so the consistency of the pruning is the most important and useful way to develop good ramification with small foliage. If there are too many clustered buds the tree will not grow freely, so you need to thin them out. Exactely my point old mate. What have you been up to of late, was the question. Nuffin!!! Bl00dy shade and beer o'clock time.